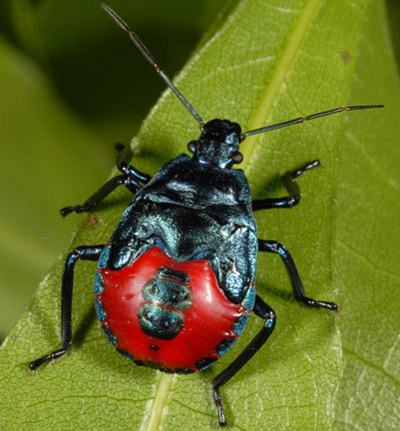 The predatory stink bug, Euthyrhynchus floridanus (Linnaeus) (Figure 1), is considered a beneficial insect because most of its prey consists of plant-damaging bugs, beetles, and caterpillars. It seldom plays a major role in the natural control of insects in Florida, but its prey includes a number of economically important species. Figure 1. Adult of the Florida predatory stink bug, Euthyrhynchus floridanus (L.), feeding on a beetle. Photograph by Lyle J. Buss, University of Florida. Euthyrhynchus floridanus is primarily a Neotropical species that ranges within the southeastern quarter of the United States. Adults: The length of the male is approximately 12 mm, with a head width of 2.3 mm and a humeral width of 6.4 mm. The length of the female is 12 to 17 mm, with a head width of 2.4 mm and a humeral width of 7.2 mm. 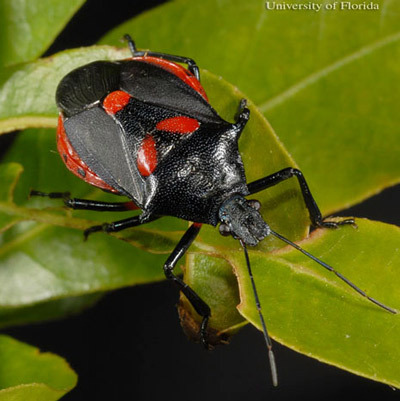 Euthyrhynchus floridanus (Figure 2) normally can be distinguished from all other stink bugs in the southeastern United States by a reddish spot at each corner of the scutellum outlined against a blue-black to purplish brown ground color. Variations occur that might cause confusion with somewhat similar stink bugs in several genera, such as Stiretrus, Oplomus, and Perillus, but these other bugs have obtuse humeri or at least lack the distinct humeral spine that is present in adults of Euthyrhynchus. In addition, species of these genera known to occur in Florida have a short spine or tubercle situated on the lower surface of the front femur behind the apex 1/4 to 1/3 of the femoral length. Hayslip et al. (1953) illustrated species in Stiretrus, Euthyrhynchus, and Podisus, and a prominently marked Euthyrhynchus floridanus was illustrated by Chittenden (1911). Figure 2. Adult predatory stink bug Euthyrhynchus floridanus (L.). Photograph by Lyle J. Buss, University of Florida. The adults of Euthyrhynchus floridanus are often confused with the banded form of Stiretrus anchorago (F.), although Stiretrus anchorago is smaller at less than 10 mm long. The shape of Stiretrus anchorago is more globose and resembles a leaf beetle. There are also differences in scutellum size, as Stiretrus anchorago has a very large scutellum covering much of the dorsum of the abdomen. Asopines have the first segment of the beak short and thick, free, only its base being between the bucculae which converge and unite behind or beneath the beak. The base of the beak is close to the end of the tylus. Other groups of stink bugs have the first segment of beak slender, and embedded between the bucculae which are wide and parallel. The base of the beak is distinctly separated from the end of the tylus. Blatchley (1926) and Torre-Bueno (1939) remain the basic keys to stink bugs in the eastern United States. Eggs: The females lay egg masses with individual eggs somewhat barrel-shaped. Eggs and all five nymphal instars were illustrated and described in detail by Oetting and Yonke (1975). Eggs (Figure 3) of Euthyrhynchus floridanus are approximately 1 mm in diameter, with short projections around the operculum, and are laid 20 to 90 at a time. Figure 3. 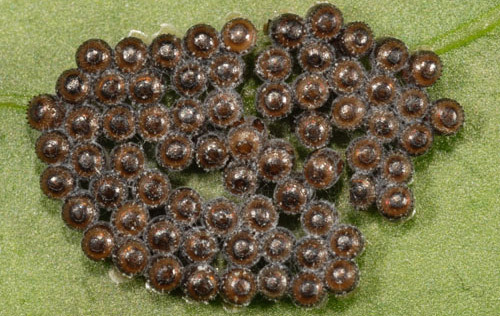 Eggs of Euthyrhynchus floridanus (Linnaeus), a predatory stink bug. Photograph by Lyle J. Buss, University of Florida. 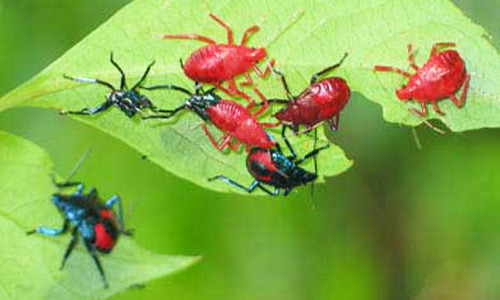 Nymphs: Identification of the nymphs (Figure 4) is less certain, particularly the earlier instars. The available keys are based on the last (fifth) instar, but key characters often apply to the fourth instar as well. Hart (1919) included a key to nymphs in the various stink bug subfamilies. 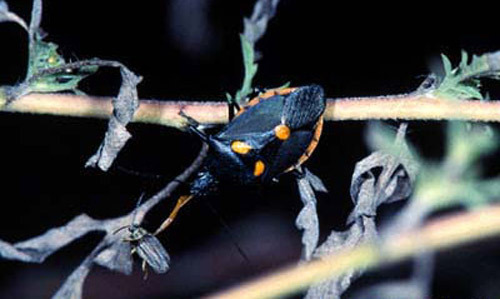 DeCoursey and Allen (1968) published a key to the fifth instar nymphs of 25 genera of eastern United States stink bugs. However, four asopine genera (Alcaeorrhynchus, Andrallus, Mineus, and Oplomus) reported from Florida were not included. 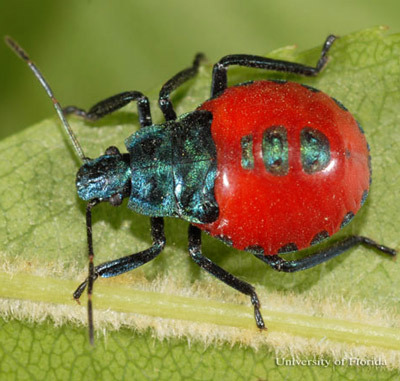 Also listed were field recognition characters of mature nymphs, with Euthyrhynchus summarized as having head, thorax, and lateral and medial plates metallic green, abdomen bright red; length 8 to 9 mm. The mature nymphs reared by Oetting and Yonke (1975) were 10 to 12.5 mm in length. An occasional mistake of beginners is to confuse Euthyrhynchus nymphs with beetles. The latter would have elytra forming a suture dorsally, and the mouthparts would be of the chewing type. Also, the young stink bugs lack wings and have tube-like piercing-sucking mouthparts. Figure 4. Recently molted nymphs of a predatory stink bug, Euthyrhynchus floridanus (L.), with one (center) almost totally emerged from exuviae (cast skin). Photograph by Lynette Schimming. First instar: The first instar is approximately 1.5 mm long. The head width, including eyes, is 0.7 mm, and the humeral width is 1.0 mm. These are difficult to distinguish from the first instar nymphs of Alcaeorrhynchus grandis (Dallas), as both have a blue-black head and thorax and red abdomen with dark central and lateral stripes composed of dorsal and lateral dark-colored plates. Nymphs of this age do not stray far from the egg mass and may be distinguished by association with the form of the mass and the numbers of eggs. Alcaeorrhynchus grandis masses are in multiple rows and contain 100 to 200 eggs. Second instar: The second instar is 2 to 2.5 mm long The head width is 0.9 mm, and the humeral width 1.1 mm. As in other asopine stink bugs, Euthyrhynchus floridanus begins to capture insect prey as a second instar nymph. It looks much like the first instar and retains the same coloration. Third instar: The third instar is approximately 4 mm long. The head width is 1.2 mm, and the humeral width is 1.7 mm. This instar is colored much as in the first instar. The iridescence of the blue-black markings is more noticeable because of the larger size of the nymph. Fourth instar: The fourth instar (Figure 5) is 6 to 7 mm long. The head width is 1.7 mm and the humeral width is 2.9 mm. It is much like the earlier stages in appearance. Figure 5. Fourth instar nymph of the predatory stink bug, Euthyrhynchus floridanus (L.). Photograph by Lyle J. Buss, University of Florida. Fifth instar: The fifth instar (Figure 6) is 8 to 9 mm long. The head width is 2.1 mm, and the humeral width is 4.8 mm. The wing pads, which are blue-black, are prominent, but otherwise the nymph is much like the preceding stages. Figure 6. A fifth instar nymph of the Florida predatory stink bug, Euthyrhynchus floridanus (L.). Notice the prominent wing pads characteristic of this stage. Photograph by Lyle J. Buss, University of Florida. Figure 7. Nymphs of the Florida predatory stink bug, Euthyrhynchus floridanus (L.) feeding on an earwig. Photograph by Anthony Ditro, Elizabeth City, NC. Euthyrhynchus floridanus has been reared in the laboratory by Ables (1975), Oetting and Yonke (1975), and Richman and Whitcomb (1978). At 26 to 27ºC, and with a photoperiod of 14:10, both Ables (1975) and Richman and Whitcomb (1978) found that the length of time from egg to adult was 58 days. The egg stage lasted 18 to 19 days. Ables (1975) reared South Carolina examples of Euthyrhynchus floridanus in the laboratory, providing prey of greater wax moth larvae, Galleria mellonella (L.); all stages of the Mexican bean beetle, Epilachna varivestis Mulsant; and larvae of tobacco budworm, Heliothis virescens (F.). The life cycle was about 89 days under the conditions provided. Oetting and Yonke (1975) reared Missouri stock of Euthyrhynchus floridanus in the laboratory, providing black cutworms, Agrotis ipsilon (Hufnagel), as a food source. Oetting and Yonke (using a temperature of 24°C and a photoperiod of 13:11) found the length of time from egg to adult was 100 days, with the egg stage lasting 33 days. These papers (Ables 1975, Oetting and Yonke 1975) included comments on the gregarious nature of the nymphs and even the adults tended to aggregate at night in the cages. Ables (1975) commented that capture of prey and feeding by early instars often appeared to be a group effort. He added that such behavior would be of a selective advantage because it would allow feeding on large prey unavailable to a single nymph. Records in the Florida State Collection of Arthropods show that Euthyrhynchus floridanus has been collected during all months of the year in Florida and in a wide variety of habitats, as its prey is highly variable. There is a peak in the spring and again in the fall. Of 140 habitat records, 25% have been ornamentals, 17% citrus, 8% in traps, 6% in weeds and turf, and the remainder in miscellaneous fruits, trees, and random habitats. Ables JR. 1975. Notes on the biology of the predacious pentatomid Euthyrhynchus floridanus (L.). Journal of the Georgia Entomological Society 10: 353-356. Blatchley WS. 1926. Heteroptera or True Bugs of North America with Special Reference to the Faunas of Indiana and Florida. Nature Publishing Company, Indianapolis, USA. 1116 pp. Chittenden FH. 1911. Notes on various truck-crop insects. U.S. Department of Agriculture Bureau of Entomology Bulletin 82, Part VII: 85-93. DeCoursey RM, Allen RC. 1968. A generic key to the nymphs of the Pentatomidae of the eastern United States (Hemiptera: Heteroptera). University of Connecticut Occasional Papers 1: 141-151. Distant WL. 1880-1893. Insecta. Rhynchota. Hempitera: Heteroptera. Vol. 1. In Biologia Centrali-Americana, London. 462 pp. Hart CA. 1919. The Pentatomoidea of Illinois with keys to the Nearctic genera. Bulletin of the Illinois Natural History Survey 13: 157-223. Hayslip NC, Genung WG, Kelsheimer EG, Wilson JW. 1953. Insects attacking cabbage and other crucifers in Florida. Florida Agricultural Experiment Station Bulletin 534: 1-57. Hoffman RL. 1971. 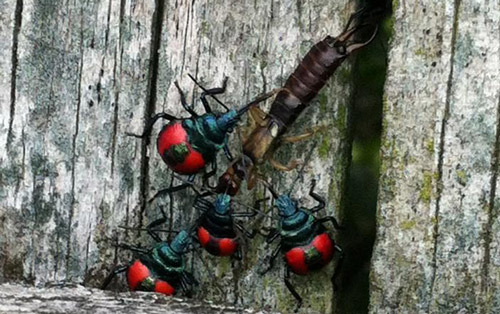 The insects of Virginia: No. 4. Shield bugs (Hemiptera: Scutelleroidea: Scutelleridae, Corimelaenidae, Cydnidae, Pentatomidae). Virginia Polytechnic Institute and State University, Research Division Bulletin 67: 1-61. McDonald FJD. 1966. The genitalia of North American Pentatomoidea (Hemiptera: Heteroptera). Quaestiones Entomologicae 2: 7-150. Oetting RD, Yonke TR. 1975. Immature stages and notes on the biology of Euthyrhynchus floridanus (L.) (Hemiptera: Pentatomidae). Annals of the Entomological Society of America 68: 659-662. Torre-Bueno JR. de la. 1939. A synopsis of the Hemiptera: Heteroptera of America north of Mexico. Part 1. Families Scutelleridae, Cydnidae, Pentatomidae, Aradidae, Dysodiidae and Temitaphididae. Entomologia Americana 19: 141-304. Authors: Frank W. Mead (retired), Florida Department of Agriculture and Consumer Services, Division of Plant Industry, and David B. Richman, University of Florida. Originally published as DPI Entomology Circulars 174 and 242. Updated for this publication. Photographs: Lyle J. Buss, University of Florida; Division of Plant Industry; Lyette Schimming and Anthony Ditro, Elizabeth City, NC. Publication Date: October 2000. Latest revision: April 2016. Reviewed: February 2019.